1.In small bowl, toss tomatoes, 1/4 cup green onions and 1 tablespoon chopped cilantro. 2.In food processor with knife blade attached or blender, purée remaining ingredients, and remaining 1/2 cup green onions and 1/2 cup cilantro leaves until mixture is smooth, scraping sides of bowl occasionally. 3.Transfer guacamole to serving bowl; top with tomato mixture to serve. Makes 2-3/4 cups guacamole and 1 cup tomato mixture. 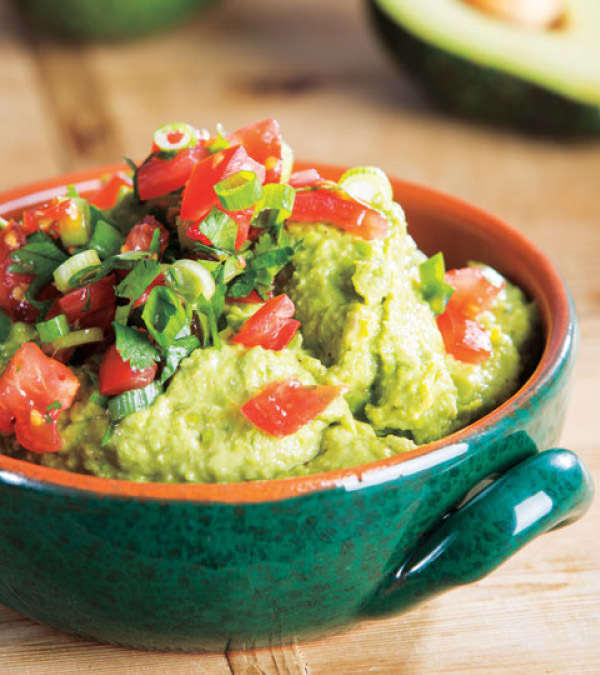 > Guacamole and tomato mixture can be prepared and refrigerated up to 6 hours in advance. Top the guacamole with tomato mixture just before serving.